• Khashoggi was a self-avowed champion of the Palestinian cause. He strongly reiterated his deep commitment to the people of Palestine recently; hence, he would be considered an arch-enemy of Israel. • Khashoggi was writing exposés on KSA and especially about the naked tyranny of Saudi Crown Prince Mohammed bin Salman (MBS); hence, he became a feared opponent of the regime in Riyadh. • Khashoggi was a deep intel insider with direct ties to the CIA (a known contractor), the MOSSAD, MI6 and the Saudi GID (General Intelligence Directorate). As such, he was privy to all the state secrets and was increasingly perceived as a loose cannon by the International Intelligence Community. His articles published in the WashPo were becoming more revealing by the month. • Khashoggi was becoming more and more unpredictable after the summary arrest and lengthy detentions of so many Saudi Arabian princes, generals and other VIPs by the Crown Prince. He was known as the one progressive journalist and covert intelligence operative who could be counted on to plead their case in the court of public opinion, which he did with great stealth and strategy. • Khashoggi experienced the extreme rightward shift into Wahhabismthat was being advocated by MBS under the propaganda cloak of liberalizing Saudi Arabia’s barbaric image. He knew well that MBS said one thing, but then acted in the opposite manner. The savage war on Yemen, the oppressive siege of Qatar, the unparalleled arrest of the Saudi heavyweights, the uptick in beheadings and the crackdown on all protest movements, especially female protesters, moved Khashoggi to criticize the Crown Prince from a very high MSM platform that has never been done before by a longtime KSA insider. • Khashoggi was no friend of Israel and saw that the MBS slyly maneuvered the KSA into an intimately close partnership with the apartheid state of Israel (and against the Palestinians). He was all too aware that deals had been made at the highest levels in Riyadh and Tel Aviv to permit the advancement of the Great Israel project to the great disadvantage of Muslims throughout the Levant and beyond. This profound betrayal alone by MBS pushed Khashoggi over the edge and caused him to cross fault lines never crossed before by a high-ranking Saudi whistleblower. Just like the assassination of President John F. Kennedy, when enough power-players among the power elite pass the verdict on any given individual, that person is neutralized post-haste. Does it really make any difference how or where or when? These are all incidental facts that often have no relation to the real perps or why they did it. The operative words are always “Who?” and “Why?” Everything else is either wholly irrelevant or totally inconsequential. Again, just like JFK, Khashoggi had a LOT of folks after him—really powerful and influential people, each one of whom could order such a high-profile hit and cover it up successfully. Not only are we talking about the entire U.S. intelligence Community, but also the British, French, Israeli and Saudi Arabian intel communities. In addition to those powerhouses, there is also the KSA regime, the Israeli government, the U.S. government, as well as the British and French governments. All of them — WITHOUT EXCEPTION — were deeply involved in the highly coordinated execution and cover-up of the state-sponsored terrorist attacks on September 11, 2001. Therefore, they all have an overwhelmingly strong interest to suppress 9/11 truth. This data point alone was enough to get Khashoggi killed a thousand times over. Isn’t this why there is so much media sensationalism about the brutal way that the Saudi journalist was killed and then cut up into pieces? In this way they are sending a message to every other wannabe whistleblower who plans on blowing the real 9/11 conspiracy wide open. That’s also why they executed Kennedy in broad daylight; to send a message loud and clear to all truth speakers with a high platform. Such truth-telling will not be tolerated by The Powers That Be. KEY POINT: Just like President Kennedy was assassinated for many different reasons with the support of numerous power-brokers across the planet (Here are just 10 of those reasons. ), so, too, was Jamal Khashoggi liquidated with multiple motives. Likewise, where the prime mover against JFK was Israel, it’s also quite likely that Tel Aviv ordered the Khashoggi hit. Then, just when the researcher thought that they had a handle on what really went down in the Saudi Arabian consulate in Istanbul on 2 October 2018, an ex-CIA case officer floats the following hypothesis: Did Zionists Execute King Salman and MBS and Set the Khashoggi Killing Up? 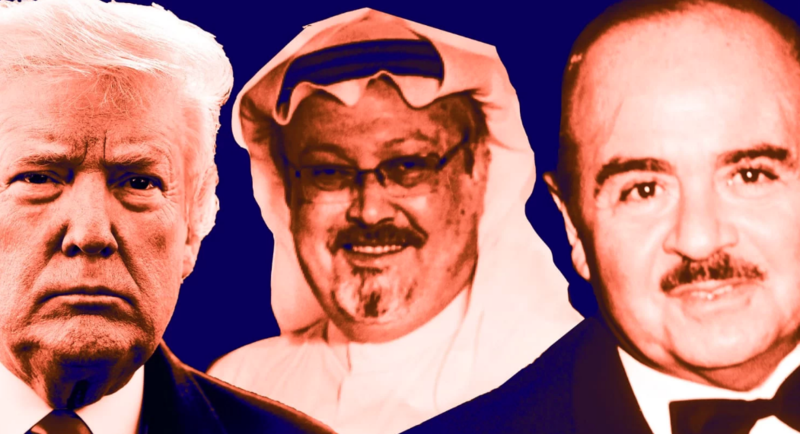 Because of the responses of the Trump administration, the KSA regime, and Turkey, it’s quite apparent where each stands on this highly trumpeted crime against an American-based journalist. Whereas it appears that Deep State is highly offended by the alleged murder, the many former CIA officials who helped orchestrate the 9/11 cover-up via their organs of propaganda throughout their Mockingbird Media seem to be relieved that 9/11 will truth stay hidden…for now. For both sides of Deep State — Democrat and Republican — had a hand in that dastardly black operation against the American people. This still unfolding story has all the markings of a classic CIA psyop. Not only are all the bad actors playing their parts perfectly in this global melodrama, the cynical purposes are becoming more evident by the day. Clearly, all the Trump-hating rogue CIA elements (read: John Brennan types) are behind this seditious plot. The seamless collaboration between the Mockingbird Media and the U.S. Intelligence Community is particularly telling. The stunning details pouring out every day is like watching the BEST SOAP OPERA EVER. Really, since when would the government of Turkey be able to produce the audio of the actual killing of a journalist in real-time (his Apple watch couldn’t even connect through the frequency-opaque consulate walls). When the CIA’s premier propaganda outlet — The New York Times — reports this highly radioactive info, you know it’s a heavy-duty black op in progress. Here’s yesterday’s tantalizing headline at the NYT: Audio Offers Gruesome Details of Jamal Khashoggi Killing, Turkish Official Says. The bottom line here is that this psyop clearly has the fulling backing and participation of all the major intelligence agencies and secret services from Ankara to Tel Aviv, from London to Washington, D.C. How could it not; they’re all playing along according to a meticulously scripted plot. Hence, it’s imperative that the real target of this black operation get with the program before they become the latest victim during the next episode. If ever President Trump got his 2018 “October Surprise” it’s Khashoggigate. After all, the Left forever schemes to overthrow Trump and will use the midterm elections to advance their treasonous agenda. Truly, there are so many red flags with this rapidly evolving spy conspiracy you know that they’re hovering right over the HUGE target in the Oval Office (via Deep State drones). Not only have they weaponized Khashoggigate against Trump, they have turned it into a fully armed fleet of AI-directed drones circling the White House. No matter how Trump reacts to this op, there’s another weaponized drone waiting for him and his team. Even the ever-vigilant SOS Mike Pompeo got caught trying to fake that everything was A-okay. See: Did Pompeo just get caught with his pants down in Riyadh? Mike really thought — at that critical time — that he could somehow preserve the good-ole-boy relationship between MBS and the POTUS. Hasty photo-ops like the one above, however, only served to build a stronger case against the framed-by-the-CIA partners-in-crime. This is exactly how the plotters wanted the Trump administration to react, as there is perhaps no other response that could be so damning. Regardless of how this pans out in the media, there is a noose being stealthily tightened around Trump’s neck. The wily strategists who wove this wicked web know precisely what they’re doing. What they don’t know is what Team Trump will do. As always, even Trump himself doesn’t know what he’ll do, which usually makes the playing of his Trump card the coup de grâce that prevents the coup d’é·tat. Remember sophisticated psyops like this USA-manufactured Khashoggigatealways have multiple goals and purposes. This one is so multi-layered it’s tough to tease out which are the perp’s primary objectives, and which are secondary. The false flag operation experts and deep intel researchers who have studied 9/11 since 2001 know that Israel was the prime mover behind that apocalyptic event. And, that the Saudis were conveniently set up to be the bad guys; after all, a Saudi son — Osama bin Laden — was identified as the brains behind an operation he didn’t even know would take place. This, factoid, then gives rise to the $64,000 question: Why Saudi Arabia? Who is looking to drive a wedge between President Trump and his favorite dictator MBS? These are the questions, the answers to which will explain every major move and maneuver on the extremely dynamic global geopolitical chessboard today. The Israeli’s determination to take down Mr. Khashoggi also cannot be discounted. It is well known throughout the world community of nations that any person in the position of real power or who wields global influence, who avidly advocates for the Palestinians, puts a target on their back. It’s true: eventually Zionist Israel will take that person down—HARD! Lastly, there is always the “distraction, diversion and misdirection” component of massive media campaigns like this one. The hype around Khashoggi has been like no other shady character in recent memory. In point of fact, the frenzy to disseminate the sordid specifics is incomparable in MSM history. Typically the Mockingbird Media does its level best to withhold any and all substantive information. Therefore, the question must be asked: Is the Kashoggi scandal a strategically timed Deep State psyop? As this analysis strongly insinuates, the murder of Khashoggi was either authentically staged for maximum effect or faked for maximum effect. In either case, the message is clear: Anyone from officialdom who reveals 9/11 truth is toast! Or, they are dismembered and cut up over a 7-hour period — while alive — like they said Khashoggi was. You talk about an “October Surprise” that keeps on giving; this plot just continues to thicken by the day. This is where the C.I.A. really excels in tightening the noose around their prey. First, there’s this MSM report: US Gets $100M Saudi Payment as Pompeo Arrives in Riyadh. Next, The Washington Post just published this little gem: WashPost: US-Saudis Working on Statement Absolving Prince in Journalist’s Death. Then the New York Times just released the following report: US Intel Has Evidence of Crown Prince’s Involvement in Khashoggi’s Death. What is especially bad news for the Crown Prince is this incriminating development in the murder case (if it’s really true): Suspected member of Khashoggi ‘hit-team’ dies in mysterious ‘traffic accident’ in Saudi Arabia. If that’s not bad enough for MBS, the AP just posted this Man Linked to Saudi Crown Prince at Consulate When Khashoggi Vanished. TMR has the distinct sense that these daily updates are going to crescendo as we approach Election Day. The October SURPRISE of 2018 to be Preceded by a September SHOCK & AWE! Well this seems like a set up to me, maybe from the British (intelligence). They do this stuff all the time. They are constantly staging events to demonize Putin (e.g. Skripal poisoning) and keep Trump from working with Putin. We know they staged events (fake gas attacks) to demonize Assad and try to get the US further involved in Syria. For all we know, this is something similar. Sibel Edmonds pointed out that if MSB wanted to kill this guy, they could have done it in lots of ways (e.g. robbery gone bad, like Seth Rich) without causing an international incident. For all we know, this guy is lying on a beach somewhere. IMO Khashoggi killing is probably a hoax, he walked out the back door while they were recording his death. Enjoying marital bliss in some warm place. This is all psyop. A manufactured event in order to move geopolitics. In my gut I smell anglo zionists, and Turkey looks involved and has revenge against US in mind. Where is Gulen? Sanctions and duties. They are trying to boot out MBS and reinstall the really nasty old guard. Bad news. It is an opportunity for more purge in SA. The old order harboured great crimes, I am led to believe. With help, MBS pulled off the first coup. This is them fighting back. We need to support MBS in this, no matter how bad they make it look. It is all theatre. Can you say #DeepFake? MBS must have crossed the Anglo Zionist mafia in some way other than the Khashoggi killing. The killing merely serves as a pretext to remove him. There is something very strange about the sudden, uniform “international outrage”. Ask yourself why this particular agenda is receiving the full court press. Why this and why now? 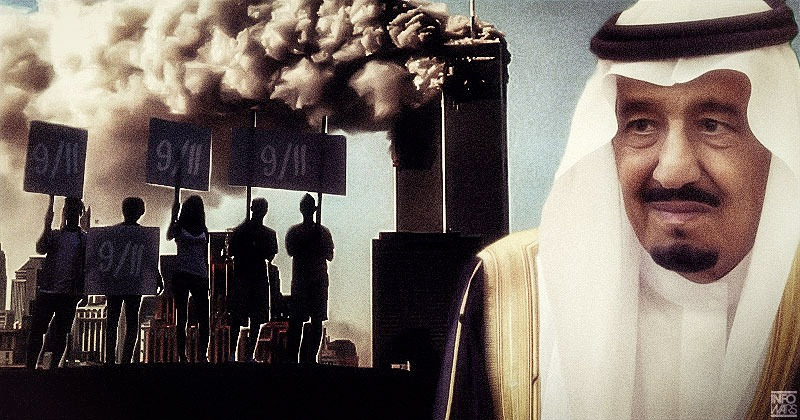 Asking #American Friends: Remember the first 48 hours after the Sep 11, Attacks?How USA Gov Allowed All Saudi Private Jets, including those carrying #BinLaden Family & Associates leave USA UN-SEARCHED & Un-Investigated despite ~3000 Dead Americans?This 4 Only 1 #Arab Journalist?! A Maltese investigative journalist who exposed her island nation’s links to offshore tax havens through the leaked Panama Papers has been killed after a bomb exploded in her car. Seems like the Deep State (central bankers who rule the world?) wants to drive a wedge between Trump and SA–why?? This is the real story. The Deep State is using it’s propaganda arm (MSM) to promote this story. The MSM pretends moral outrage over one dead journalist, but has no problem with SA bombing children in a school bus and starving the Yemeni people. It may be coming!!! Here how it will go: The perpetrators left their #Saudi Intel ID cards (with barcodes) behind in the abandoned vehicle; further, a hand-written directive to torture-slice-dice #Khashoggi written by #MBS himself was tucked inside the dashboard!”!!!!!!!! It appears that a body has been found in the garden of the Consul’s home. No surprise here because a Saudi diplomatic van was seen to enter the Consul’s compound the same day after Jamal disappeared. Camera zoom in on Obama to make it look like he has a huge crowd, yet twitter user from different angle shows true size of crowd. Looks like a green screen behind him. Yes, I know… but Sibel Edmonds has joined a small group of writers exposing the Jamal Khashoggi disappearance as psyop designed to put pressure on MbS on behalf of the globalist financial interests looking to profit from the neoliberalization of Saudi Arabia. It’s good work and worth reading. 9/11 was commercial insurance fraud, and a very profitable one at that, dressed up to look like an act of terrorism, in order to bring down the asbestos ridden and condemned Twin Towers that would have cost more to refurbish and rehabilitate as urban renewal then the money-losing White Elephants were worth. This is like the old organized crime mob trick that if you have a building that can’t be rebuilt and can’t be legally torn down, then torch it for the insurance money, and with the fraud of 9/11, to have a false-flag excuse to start a never-ending global war of terrorism in order to feed the international bankers, NATO, and the ever-hungry war machine of the MIC at the Pentagon. According to some estimates, the Twin Towers contained 5000 tons of asbestos materials. As long ago as the mid-1990s, the New York Port Authority was looking at an asbestos abatement bill of as much as $1 billion dollars – representing well over 12 times the buildings’ original cost. When the buildings’ insurers, Affiliated FM, refused to cover the asbestos removal/abatement costs and won their subsequent lawsuit over the the matter, the Port Authority was left with some untenable choices. The outdated buildings could not be demolished because of the asbestos; for the same reason, they could not be remodeled and updated in any cost-effective manner. The only other option was to slowly dismantle the Towers a piece at a time – the cost of which would have run into several billions of dollars. How convenient that real estate developer Larry Silverstein was willing to take over the buildings … solving 9/11 ends the wars. In addition, if you look at monetary policies right after 9/11 – I remember I was over in the City of London driving around with a money manager and his phone rang and he answered it on his speaker phone. It was somebody on Wall Street who he hadn’t talked to since before 9/11, and he said to him: “Oh Harry, I am so sorry about what has happened, it must have been very traumatic.“ And the guy said: “Don’t be ridiculous! We were able to borrow cheap short and invest long, we’re running a huge arbitrage, we’re making a fortune, this is the most profitable thing that ever happened to us!“ – So you could tell the monetary policies and sort of insider games were just pumping profits into the bank at that time, so that was very profitable. But of course the big money was used for a significant movement of the military abroad and into Afghanistan and then into Iraq. You could see that the country was being prepared to go to war. And sure enough, 9/11 was used as a justification to go to war in Afghanistan, to go to war in Iraq, and commit a huge number of actions, and now much of the challenges about the budget are the result of extraordinary expenditures on war including in Afghanistan and Iraq and the costs of moving the army abroad and engaging in this kind of empire building with ground military force. So I think if you ask Cui Bono on 9/11, one of the big categories was all the people who made money on engineering the popular fear they needed to engineer these wars. I believe whether it was financial fraud, engineering new laws or engineering wars, it was a fantastically profitable covert operation. 9/11 was the first time that this kind of violence became overt. Basically, we killed 3000 plus middle and upper-middle class office workers and did it in broad daylight. I think a lot of people in America assumed that they were protected – so this kind of thing happened to black people, this kind of thing happened to poor people, this kind of thing happened to people who didn’t play ball, but there was always the feeling: If I’m white and play ball, then it won’t happen to me. And this was sort of the new news from the breakaway civilization: If it is convenient for us it will happen to you.